Solid state drives might be all the rage right now, but traditional magnetic-based storage still rules the roost. Many corporations are moving to a tiered storage approach utilizing SSDs, but they still require massive capacities at a relatively economical price. Most server farms have moved to the 2.5-inch hard disk drive format in order to increase storage density and decrease power consumption. These smaller drives have less capacity, but you can fit many more of them into a blade server. 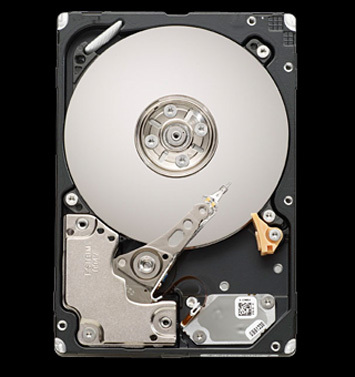 Seagate is one of the biggest suppliers of 2.5-inch HDDs spinning at 10k RPMs. The company is introducing its latest Savvio 10k.4 drive today at 450GB and 600GB capacities. It uses 3 platters to achieve this, which is a little strange considering that it is already using a higher areal density in some of its mobile offerings. Competitor Western Digital is also planning to launch a 600GB version of its next-generation Velociraptor 10k drive within the next few months. The reason is that its customers have been clamoring for more capacity, according to a well-placed source within Seagate. The company is working on another enterprise drive that will use 300GB platters, but that won’t be available until later this year. Instead of waiting, the company went ahead with the technology it had. Enterprise level drives require extensive testing and verification before acceptance, so Seagate was able to collect a lot of data on the new drive. The Savvio 10k.4 manages to achieve a 2 million hour Mean Time Before Failure and a 0.44% annualized failure rate, making it the first to do so. This gives it 20% higher reliability than any other drive, according to the company. It also has a very high Unrecoverable Error Rate of 1 sector in 10E16. The drive will be available with either a 4Gbps Fiber Channel or 6Gbps SAS interface, along with a five-year warranty.